Marcus Lyon, a British artist and photographer working in Detroit, is in the third month of an ambitious, long-term "identity art project." He's talking with, recording and photographing 100 local women and men nominated to represent a cross-section of the community. 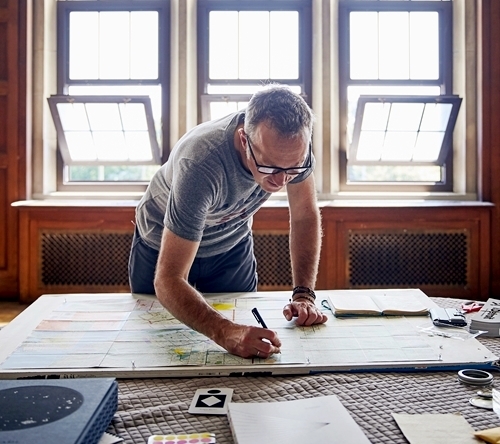 His foundation-backed undertaking is called "I.Detroit – A Human Atlas of an American City." Lyon, 53, describes it as a "social-impact art initiative," similar to two earlier projects by him -- a study and portrait exibit last fall of 51 Germans called "WE: deutschland" and a 2017 multimedia exhibit and book titled titled "Somos Brasil" ("We Are Brazil") that explores the country's diversity through 104 people. Now the visiting creator is trying to "map the change agents of the city of Detroit," as he puts it recently in a social media post. 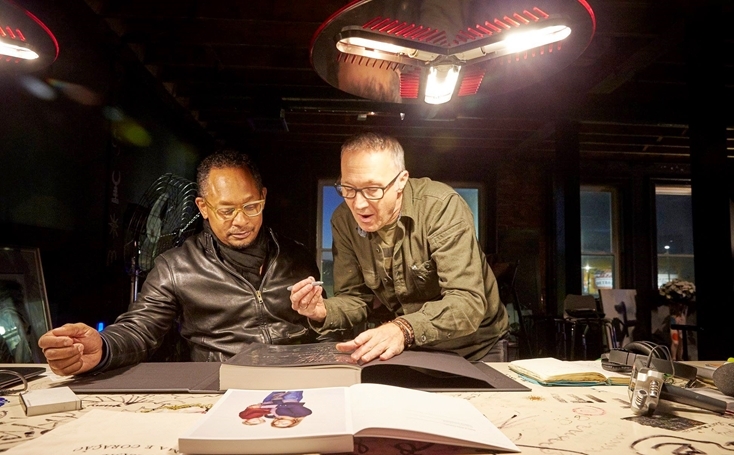 His oral history and visual project is supported by a Kresge Foundation grant and affiliation with the Charles H. Wright Museum of African American History. They helped form a "curatorial committee" to nominate participants. Lyon, assiated by a recording engineer and producer, works from a studio in the former Durfee Elementary-Middle School on Collingwood Street in the Boston Edison neighborhood. The reovated building now houses the Durfee Innovation Society, an "opportuniuty hub" for community programs and tenants. Residents on the other side of "I.Detroit" lenses and microphones include incoming Congresswoman Rashida Tlaib, Rev. Larry Simmons of Brightmoor, gallery owner George N'Namdi, jazzman Marcus Elliot, housing advocate Michele Oberholtzer, artist Nora Chapa Mendoza, Assistant Police Chief Lashinda Stair, writer Marsha Battle Philpot, City Hall "chief storyteller" Aaron Foley and singer Renee L. Hollins, an executive producer on the project. Twenty-one images from the project's Facebook page are below. Lyon hopes to present the multimedia project by summer 2020. 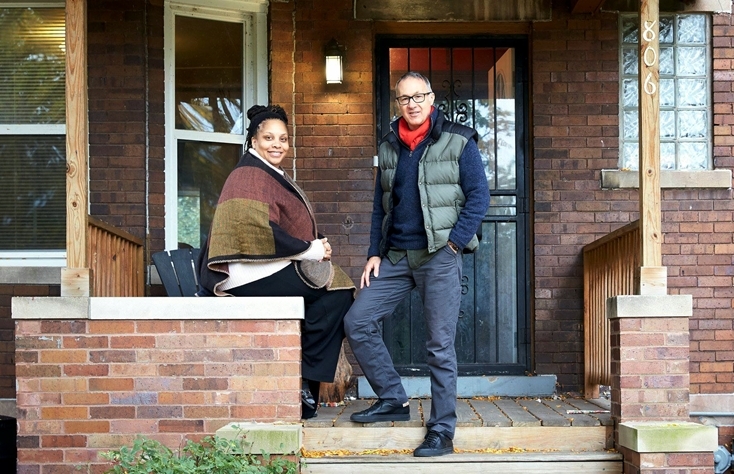 "I’m very attracted to spaces where there are people who are dispossessed, who are underrepresented in a way," he told columnist Ingrid Jacques of The Detroit News earlier this year. "The major focus will be on those who have stayed and stuck it out in the dark years." 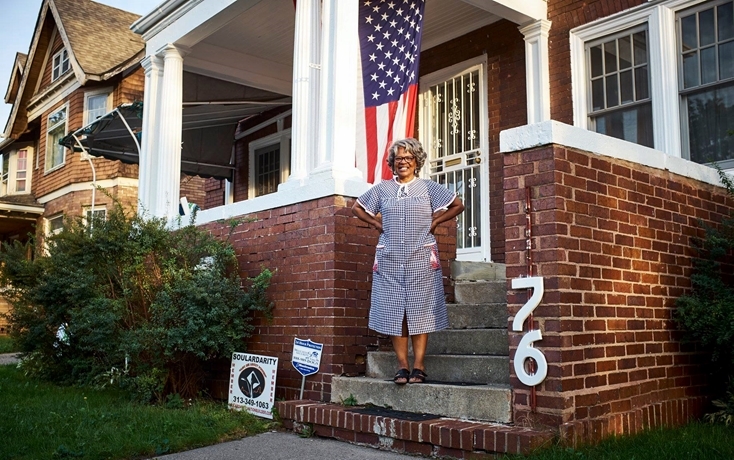 Wendy Lewis Jackson, managing director for Kresge’s Detroit Program, says this is a chance to highlight the city's neighborhoods and the work that often goes on behind the scenes — and the people behind these revitalization efforts. "The project should bring a deeper understanding of how change is occurring in the city right now." George N'Namdi (center) at his N'Namdi Center for Contemporary Art, 52 E. Forest Ave. in Midtown. Marcus Lyon is at left and Joe Briggs-Price is at right. 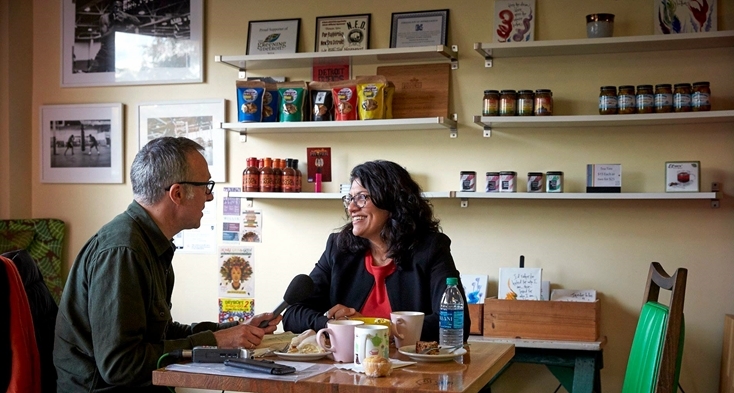 Rep.-Elect Rashida Tlaib of the 13th Congressional District on Jan. 3 becomes the first Palestinian-American in Congress. Bernita Bradley, community engagement manager for Enroll Detroit, is a longtime advocate for Detroit parents and studentrs. 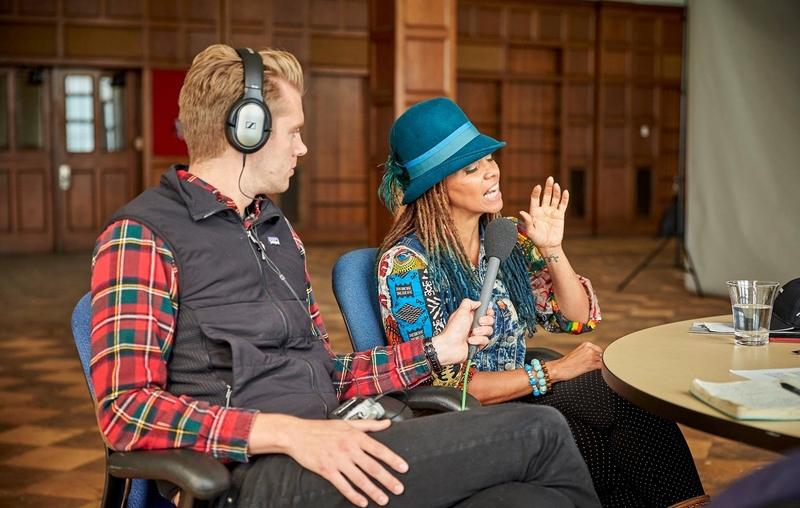 She speaks with recording engineer Joe Briggs-Price at Osborn Community Center. Derrick May is one of the local pioneers who "invented a global music genre that has kept three generations of young, and not so young anymore, people dancing til dawn," posts Marcus Lyon (right). 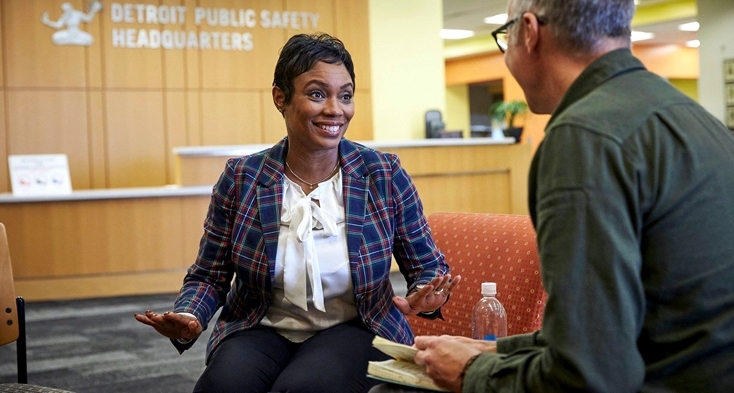 Lashinda Stair, first assistant chief of the Detroit Police Department, inspires Lyon with her "triumph over adversity, her story of success in the face of poverty and struggle." Award-winning painter Nora Chapa Mendoza has exhibited nationally and internationally. 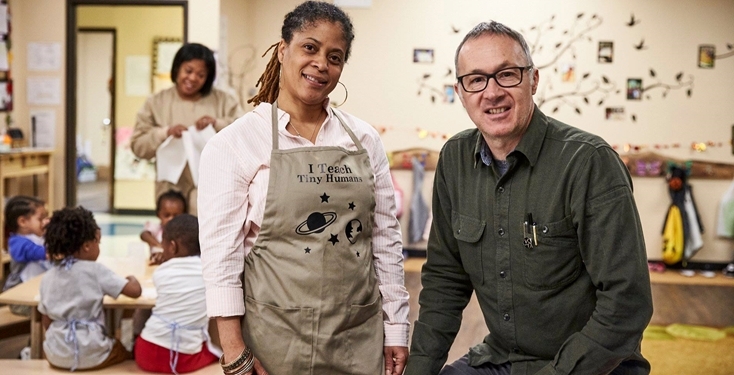 Cheryl P. Johnson, chief executive of the Coalition on Temporary Shelter (COTS), has worked there for 28 years. She and Lyon pose alongside the Belle Isle fountain. 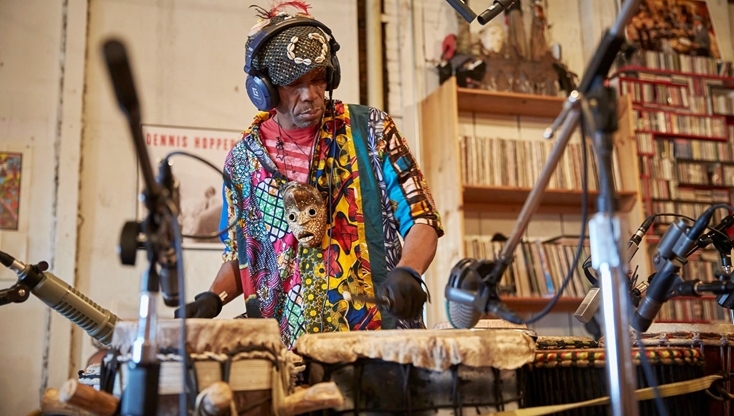 Drummer Efe Bes is the founder and lead musician of Bambuti a music and movement group. Adnan Charara, a Lebanese-American artist, came to the United States in 1982. Jessica Care Moore is a nationally recognized poet and spoken word recording artist. She's executive producer of Black Women Rock events, which salute "the women who came before us anbd empower young women to tell their stories on their own terms." Historian and writer Marsha Battle Philpot speaks with Lyon at her home. 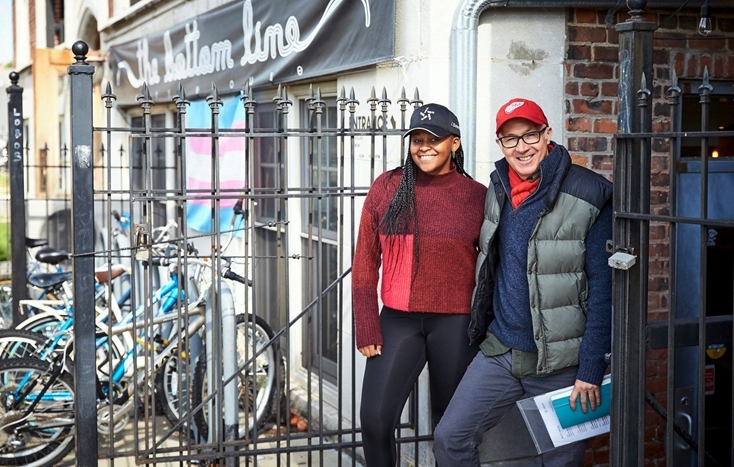 Community activist Crystal Bernard, a Social Justice Youth fellow at the Universuty of Michigan, poses with Kyon outside The Bottom Line Coffee House, 4473 3rd St. (MIdtown). Early childhood developmnent specialist Zina "Mama" Davis. Housing advocate Michele Oberholtzer, shown in her yard, talks about "why Detroit's foreclosure crisis still requires significant work to turn the tide of extreme poverty and homelessness," Lyon posts. Pashon Murray at Detroit Dirt, a composting and waste collection company she started in 2010. 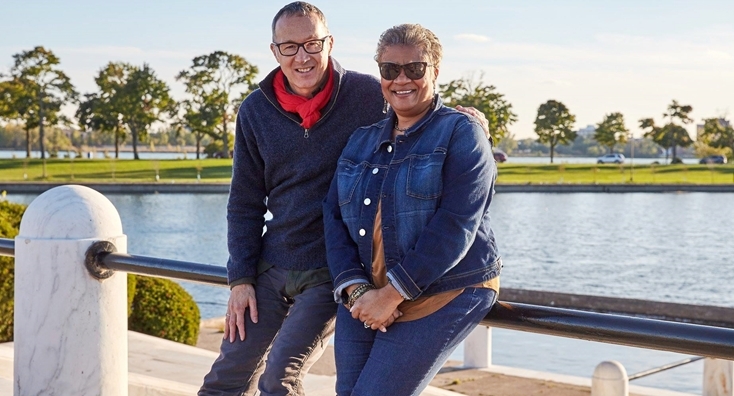 Mark Wallace, shown at RiverWalk behind the GM Renaissance Center, is president and CEO of the Detroit River Conservancy. 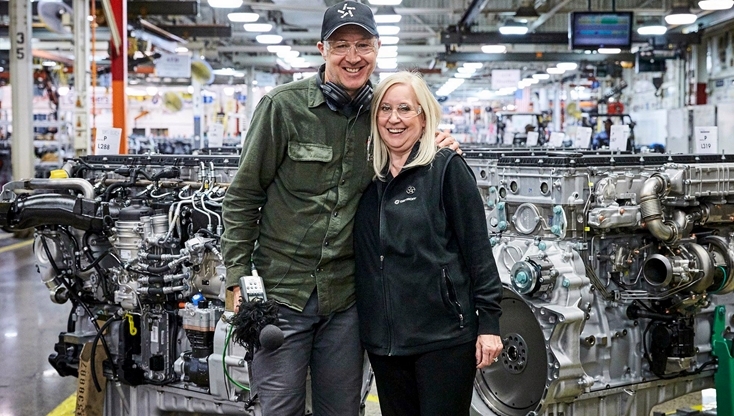 Pam Esshaki is assembly quality coordinator at Detroit Diesel, where she has worked 45 years. 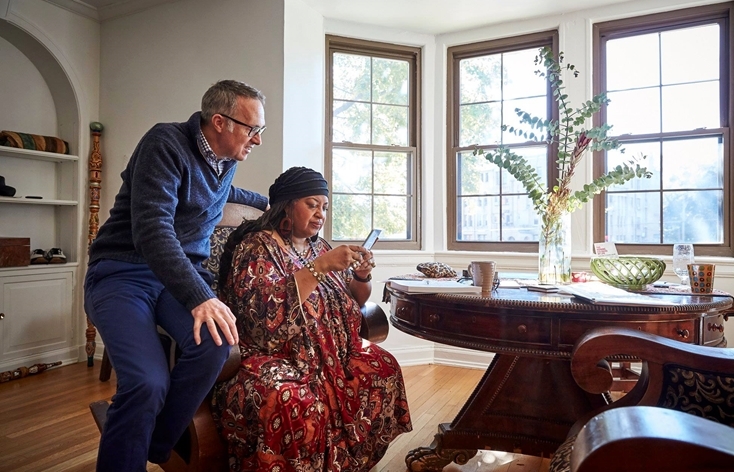 ShaCha Geronimo is an "extraordinary healer and visionary community leader," Lyon says. Phillis Judkins on her North End porch. Lyon calls her a "street champion, agent of change and life force of the North End Neighbourhood Patrol." School board member Misha Lj Stallworth, a Detroit native, is arts and culture director at Hannan Center, which works "to enhance the quality of life for senior citizens." She has a University of Michigan social work master's degree. Shamayim Harris, better known as “Mama Shu,” lives on Avalon Street in Highland Park neighborhood just north of Midtown. She started the Avalon Village projectr there to transform her blighted block.